Familiprix Asbestos Flyer & Hours. 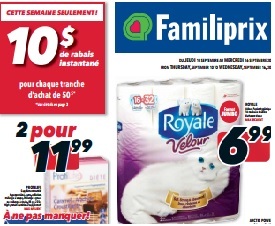 Familiprix 431, 1re Av, Asbestos, J1T 1Z3, Quebec store opening hours, weekly flyer, best deals & specials, Boxing Day Sales, location, phone number. Special Store Hours: Boxing Day, Black Friday, Cyber Monday, Good Friday, New Year’s Day, Canaday Day, Labour Day, Christmas Day, Easter Monday, Victoria Day, Thanksgiving Day, Remembrance Day, Family Day or Civic Holiday. Familiprix is a Canadian group of independent pharmacists, with nearly 300 pharmacies across Quebec and New Brunswick.